One of our favourite towns to recommend here in Alicante is Los Montesinos. Discover thoughout this article the most interesting aspects of this charming place in the south of Spain, as well as our brand new cheap apartments for sale in Los Montesinos. We work hard every day in order to provide you a special place to enjoy in Alicante and Murcia. This month we are glad to introduce you to Los Montesinos, a gorgeous town plenty of friendly people and beautiful landscapes. With around 5.000 inhabitants, Los Montesinos represents one of the best places to live in the south of Alicante. Los Montesinos shares borders with other well-known towns in the area as Algorfa, Almoradí, Rojales, San Miguel de Salinas and Torrevieja. So you will be able to visit other charming locations without any problems. In fact, the road connections are multiple and modern (including the access to the A7 highway). Los Montesinos has a very soft climate during the whole year, with an average temperature over 10 °C in the coldest month. As far as the economy of the area, the tourism is a remarkable sector but the agriculture (especially based on citrus fruits and vegetables) is also an important industry. The high offer of golf clubs is other interesting characteristic of the area, so if you love this sport Los Montesinos will be a great place where you can buy a fabulous apartment or villa. 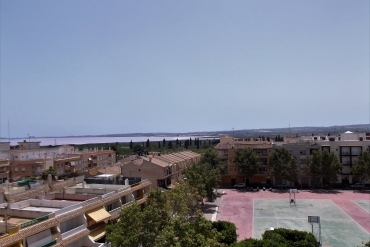 If you are interested in this town, we wish to remind you that now we have available cheap apartments for sale in Los Montesinos. With a reduced price (just 59.900€), 2 bedrooms and a spacious solarium, this cheap apartment for sale represents a great opportunity. Remember that we are always at your disposal to provide any information about our cheap properties for sale in Alicante and Murcia.